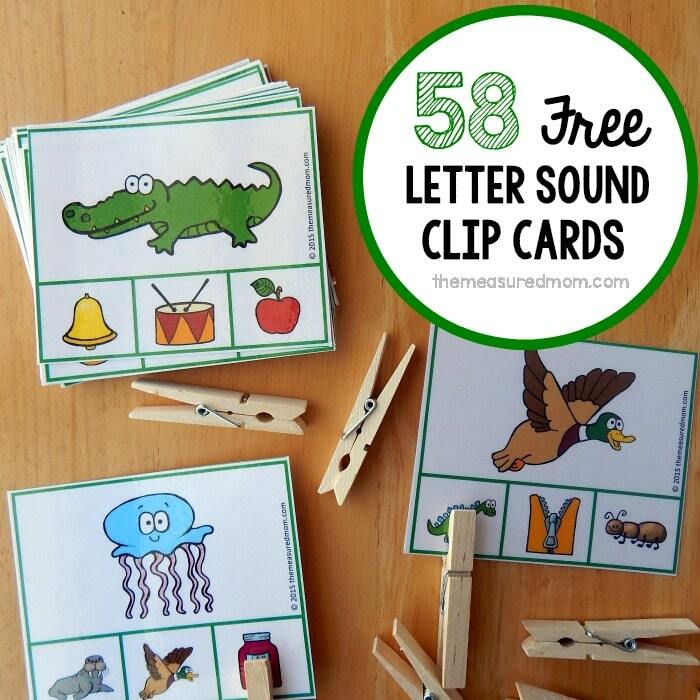 Free Letter Sounds Activity – Clip Cards! 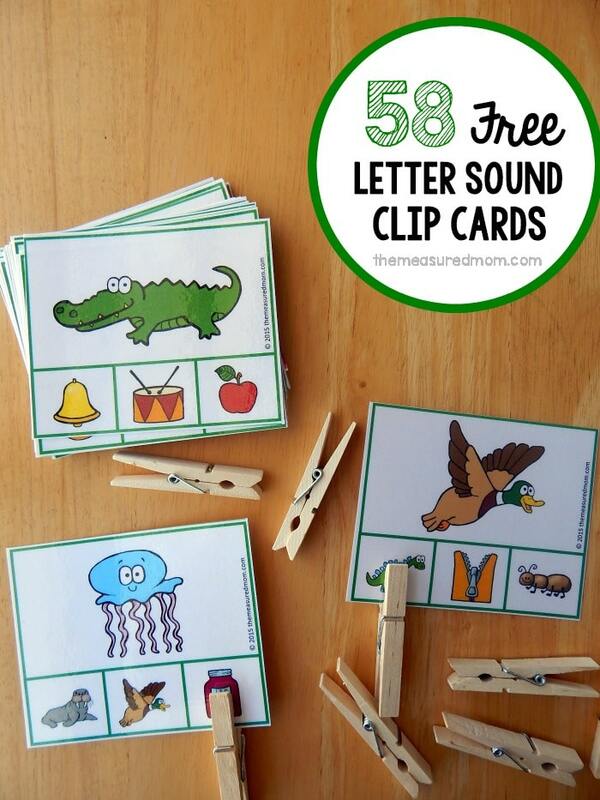 Print this free letter sounds activity to help your child identify beginning sounds in words. 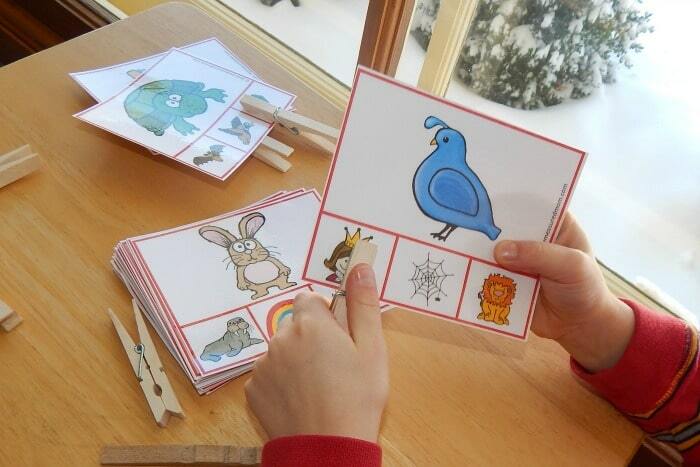 We’ve done a lot of beginning sounds activities around here. You may have seen our 25 match mats, our beginning sound coloring pages, and our Beginning Sound Blackout. 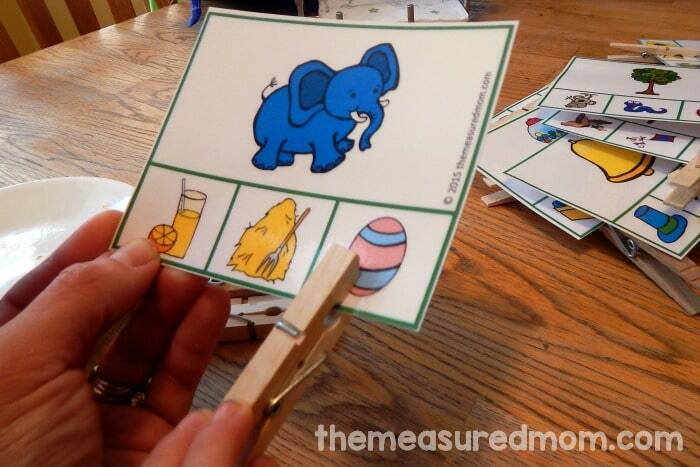 If those activities are a little tough for your child, you’ll appreciate this activity. It takes a little step back. Do you notice how there aren’t any letters on these cards? That’s intentional. The point of the activity is not to teach which letter makes what sound, but to help children hear and identify beginning sounds. This can be trickier than you might think! The idea is simple. Clip the picture that starts with the same sound as the main picture above. The download comes with both a green and red set. Each set has one card for each letter. For example: Say the word turtle. Now say duck. See how your tongue is right behind your top set of teeth when you start each word? Try zipper. Now say snake. See what I mean? Volcano and frog. Both times, your teeth are on your bottom lip. How about ant and elephant? Those vowel sounds are tricky. I figured my Four wouldn’t have any trouble with these cards. The consonants were no problem at all. But the vowels threw him for a loop. Each time, I had to help him choose the correct picture. This tells me we need more listening activities to help him hear the difference between vowel sounds. Stay tuned for those! I pulled out the easier set of cards out for my just-turned-Three. Unlike his older siblings, identifying letter sounds in words hasn’t come quickly. He had fun saying the names of the pictures with me, and he loved clipping the answers. But the whole activity went over his head. “Look at this picture! Elephant! /eh/ /eh/ elephant. What’s this picture? No, listen again. JUICE. Do you hear /eh/ /eh/? I’m not concerned yet. 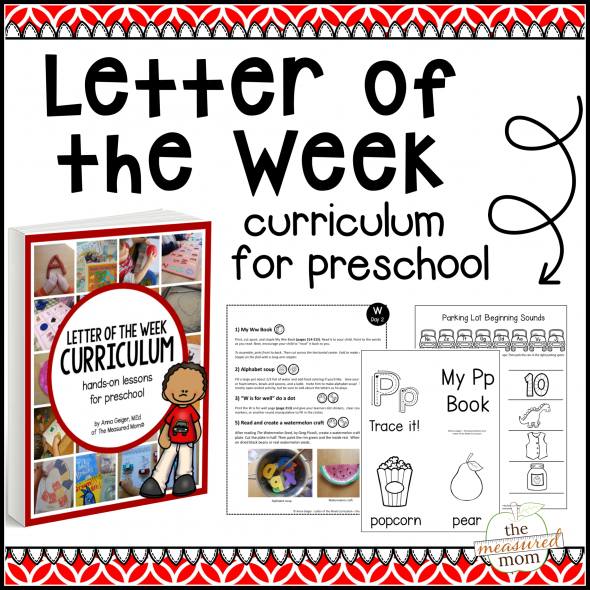 We just started letter of the week, and we talk a lot about letter sounds. When fall comes around and we’ve been through the whole alphabet, I’ll find a new plan of attack if this is still an issue for him. My suspicion is that he’s just not developmentally ready to identify beginning sounds in words. Bonus! 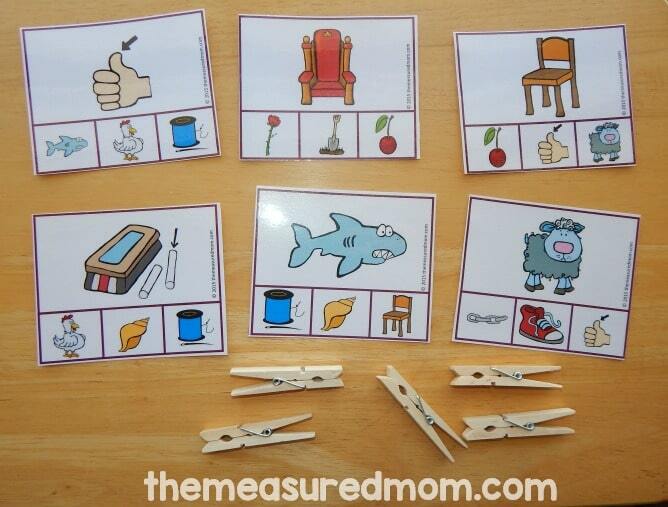 The set also comes with pictures for these common digraphs: th, ch, and sh. P.S. 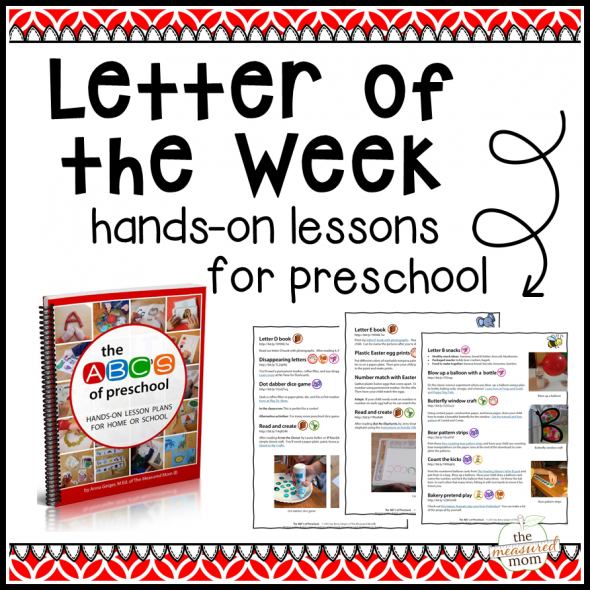 Would you like to learn more about teaching the alphabet? I’ve written a free e-mail series just for you! 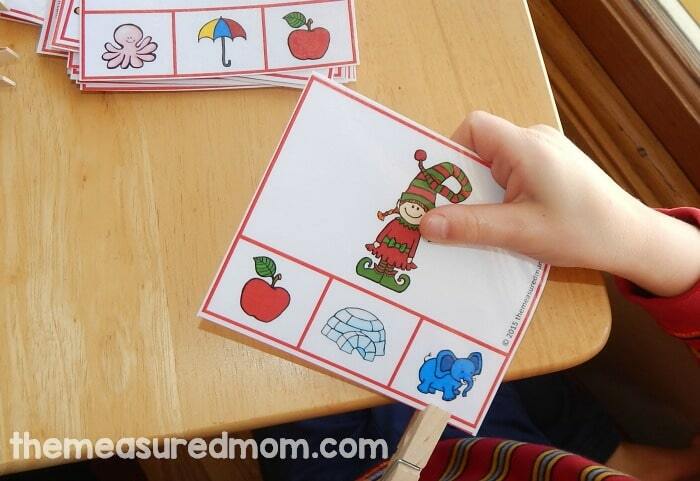 Check out some of our other free printables! 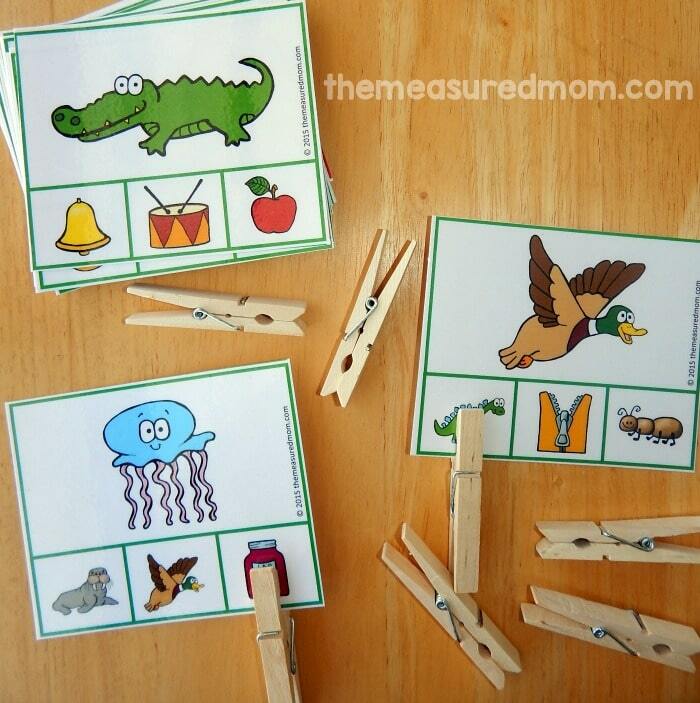 Looking for more ideas for teaching the alphabet? Love! Especially for three year olds. Thank you for this great activity. 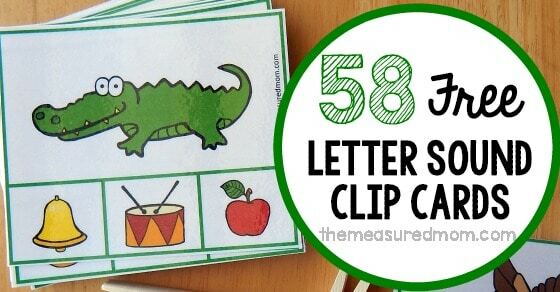 I like that it eliminates the sometimes daunting aspect of letter awareness, and it focuses on similar sounds. It will give my three lots of listening detective practice! These look great! I just made a set for Free Homeschool Deals to go live next week. Great minds think alike, I guess. Ha! Thank you so much! Your activities are wonderful! Anna, thank you so much for this wonderful activity! 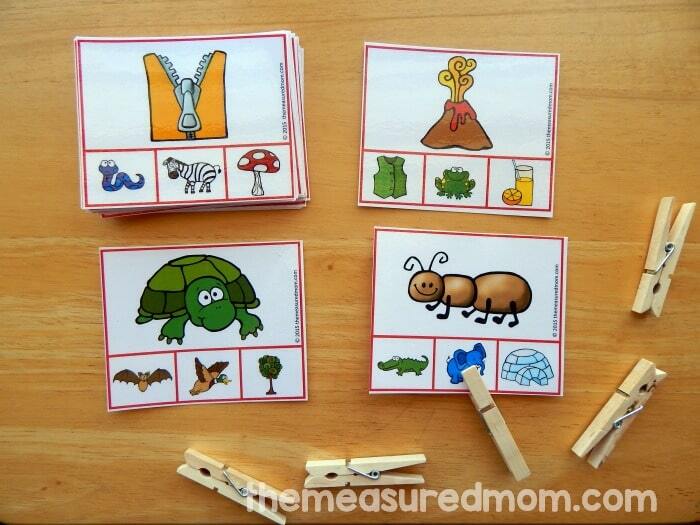 You have a lot of great resources for my pre-k students. I plan to implement several of your activities this fall. Thank you so much and keep up the great work. We teachers need you. I would also like to learn how to make cards and games.Any pointers will be appreciated. You’re very welcome, Belinda! I don’t have tutorials for making printables, but my biggest advice is to use MS Publisher. I like how easy it is to manipulate text boxes and images in that program. For images I usually purchase mine on Teachers Pay Teachers because most of those can be used commercially. You can find free image sources if you are not going to sell or share your printables online. I love your letter sound clip cards, but am unable to print them at home because my printer has decided to stop working. I was trying to save them to be able to print at Office Depot, but am unable to. Would you be able to help me with this. I would really appreciate it. Thanks for your help. If you right click on the link to download, you can save the file to your computer. I’m not sure how you bring the files there to print, but you can call and ask. Hope that helps! Thank you for all your hard work. My kids love these centers. Love them!! Yay – that’s wonderful to hear, Lucy! Another teacher referred me to your website. Thanks soooo much for sharing theses resources. Not only do I appreciate these cards, but that you mentioned the trouble your little one was having with vowel sounds. I am seeing that with my daughter, especially with soft vowel sounds. Detecting letter nuances is tricky, but I am glad that we aren’t the only ones experiencing difficulty. Thank you for sharing. Thank you for the additional help! Have a wonderful weekend. You would need to download the file to your iPad and then open it to print. I don’t know how to save files on an iPad. You are the Best. Thank you for taking care of so many of us! That’s so nice of you to say, Cheryl! I’m so glad you can use my resources! Thanks very much, Anna. This is a great resource that I m going to use with the students in my classroom who are sill experiencing difficulty in recognising and pronouncing the initial sounds for words. The pictures are clear and I feel sure that will also help them with this skill. I’m so glad you can use them, Noleen! Turtle and duck should be right behind your TOP set of teeth (bottom for zipper and snake). Thanks for that catch! Fixed it!